November 13-15, 2015, San Francisco. A group of basic income supporters joined forces for the first ever basic income ‘create-a-thon’. For those not familiar with the concept of create-a-thons, these are events where people from a range of professions meet up voluntarily to work and create something together. In general, they gather to work on a project that has a social dimension. Those events are inspired by the now famous hackathons that bring together software programmers, project managers and other creatives to work on developing new projects in just a few hours. The motto of the events: efficiency, creativity, and innovation. So what does this have to do with basic income? The idea of the organizers was to use the great concept of create-a-thons to further the struggle for an unconditional basic income. They launched the event to harness the energy, creativity, skills and competences of an incredible mix of people over the course of a weekend. 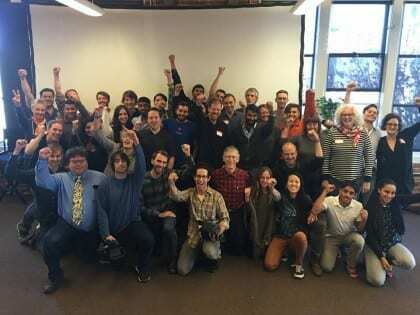 More than 100 people showed up at one point or another in the nice offices of the company Brigade in San Francisco, California. It really did look like a tech event: dozens of MacBooks and a lot of coffee. Developers, artists, filmmakers, community organizers, educators and seasoned basic income activists worked side by side. The participants chose a project, a sub-group, and then spent their weekend working on a particular idea. So what did people actually do? A filmmaker made a movie where he asked each participant why we should support basic income. A group made a film called ‘Tell It To The Sun’ – a journey into the deepest reasons why people got interested in basic income in the first place; it made a few people cry. There was also a team that came up with a list of 100 reasons against basic income. Their idea was that better categorizing the objections is a first step in sketching a guide for campaigners. Helped by a group of activists that came all the way from Germany, another group launched the first American My Basic Income campaign in just three days! Everyone was amazed that all this content was created so quickly. You can see the full list of nine projects here. Now the organizers are planning to help others create more basic income create-a-thons. They want people to benefit from this experience and are supporting those who want to meet up and get projects in place – click here if you want to find out more. Create-a-thons provide a great platform for basic income supporters to rally and coordinate, simply by inviting them to spend joyful and hopeful weekends working together. There is no doubt that many of the projects that started in San Francisco will have a long life. And what better way to prove basic income skeptics wrong? The hard work and creativity unleashed at the first basic income create-a-thon show that people work and contribute to society in meaningful ways even when they don’t get paid for it. If people are willing to spend their precious weekends working together for a better future for all, then imagine what they could do for their communities with the extra time and security an unconditional basic income would afford them. Juliana Bidadanure has written 2 articles. Juliana Bidadanure is an Assistant Professor in Philosophy at Stanford University, and is affiliated to the Center for Ethics in Society. Her interests lie at the intersection of Philosophy and Public Policy. She co-organized the 2015 conference on ‘The Future of Basic Income Research’ at the European University Institute in Florence. What is the acceptable level of Basic Income if children are not getting it? Would it be enough to have 1.5 kids on average? If children are to get basic Income how many children can we have per adult? What level of wealth concentration is optimal for the economy? Basic Income can be used as a regulating mechanism to maintain optimal wealth concentration. What is the optimal Fed interest rate? It’s pretty clear that there can be no one “right” answer, just as a $15 minimum wage in NY City might be adequate, it would probably crush economic activity in a place like rural Louisiana. This is one of the reasons I feel so passionately about a basic income—it largely avoids this trap; after all, it’s about making sure people can live—there is no chance a basic income would allow just anyone to live on Central Park West… Worst case, it would give anyone who wanted to move to a place with cheaper housing a safety net to do so. Let the hedge fund guys clean their own condos. I’m absolutely convinced that basic income CAN be used to improve both human dignity and the stability and function of the economy. I’m very hesitant though to try to tune things to any kind of global “optimum”, since conditions vary by location and can and will change. I’m a big proponent of trying to tweak things continuously. And there are so many things we can now clearly see are disastrous (health care, public infrastructure, poverty) where it’s very, very unlikely we’ll make anything worse by trying to improve it. My suggestion is that we take the big steps that are obvious low-hanging fruit and see where that gets us. Then “wash—rinse—repeat” until it gets hard to further reduce human misery. Then keep trying harder. How can the answer be, “it depends”? It is a simple question, do people receiving basic income get to have children or not? Because if no money, no responsible parenting is possible. You deserve an answer and I am surprised – well shocked comes closer to how I feel – that no one replied with an adequate answer. IF, as many UBI’ers suggest, we use the Alaska Fund as a template for UBI then children would receive BI. How many? Well, that is a good question. We could assume some limit if the UBI for children was the same as adults, but I doubt that would be the case. (Assuming universal free health care). Intuitively I suspect the birthrate would not increase at all since so many other factors play into the decision to have children. Now some cultures/religious communities with the notion that big families are mandatory may experience some societal pressure to conform, or there would be a limit to benefits. This is all speculative and I don’t think you were interested in the arcane. Your second question re the level of basic income is much more interesting and problematic. Should we consider the current popular fear (and partial reality) that decent welfare benefits would drive migration to those places with good benefits? Again, I would intuitively think that if I lived in a rural area with few jobs but friends/relatives/a beautiful landscape AND an adequate income to have a sustainable life I would want to stay there. Let me push the limit on the length of this comment by mentioning one fear I have about how people view UBI. I fear that some people might see it as a kind of magic key, when in fact it is simply one step in creating a new society. One based on a principle of justice (and one that was observed at least partially in antiquity and wholly in pre-history) that individuals have a right to a decent livelihood. Capitalism (to be cryptic about this) took us on a centuries long ride into a faux prosperity based on a vapid appreciation of the human soul (so to speak). To retrieve what has been lost, abused, and utterly destroyed (almost the planet!) will require more than UBI. BUT to focus the discussion there – on the right to a livelihood – is a great place to begin thinking about that transformation. I would recommend Andre Gorz as a person who wrote about these issues. I think one aspect of the current human predicament continues to increase the need for a UBI: the displacement of human labor by technology. As AI and robotics replace more and more jobs throughout the labor market (both service and professional, blue collar & white collar), the ONLY humane response to the resulting unemployment and wealth inequality is a UBI scheme of some kind. We can do better than “it depends”The framework of interdependent international human rights treaties, especially for economic social and cultural rights (escr) provides an excellent mechanism for determining the amount and delivery method for a basic income. As escr (like all such treaties) is predicated on self- determination for best use of resources for achieving substantive equality, it provides a legal and standard based system that communities, states, countries can use to determine what constitutes a livable basic income and what policies and programs can be engaged to maximize decent sustainable employment. It also supplies the foundation of an ongoing accountability process to ensure that income security and sustainability measures keep up to date with the unfolding reality of human evolution within climate change. We need such comprehensive approaches to ensure that human civilization can transition to long term sustainability (and clean up the current mess) before we degrade the biosphere to the point where few humans can survive.